Morning! I hope you all had a spooky Halloween, I had so many trick and treaters that I actually ran out of treats! Thankfully there were no nasty tricks discovered in the garden this morning. Now spooky season is over I thought I would create something pretty for todays post. There is something magical about ballet, the way the dancers manage to cast a spell over the audience and take us in to a world of make believe. Perhaps it is this spell that makes most three year old girls want to be a ballerina. I know I loved ballet classes when I was little and my own daughters have all at some stage loved the idea of being a ballerina. Also the storybook mouse of Angelina Ballerina has captured the imagination of little girls as they practice pirouettes across their living rooms all over the world. I recently read Ballet Shoes by Noel Steatfield with my eldest daughter and loved the story as much now as I did as a young girl. So for todays post I have some inspiration to help get you started in planning a pretty pink ballet party for your own budding ballerinas. Perhaps you would like to make your own invitations from pale pink card cut into the shape of ballet shoes. There is also a good selection of invitations available in shops and on the internet. My favourites have to be the beautiful tutu invites above from Aimes Design, I’m just not sure how you would get them into an envelope? 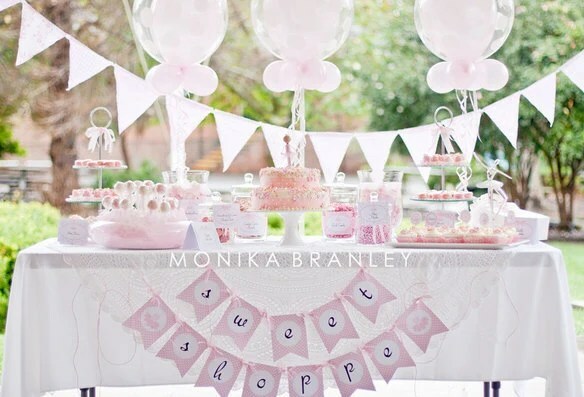 Plush Parties have everything you need to make a beautiful party. This printable set from The TomKat Studio is perfect for a ballet party. This table setting from Le Petit Party certainly has the wow factor! I love the large fan circles in this display from Pizzazzerie. Tissue paper pompoms would make pretty decoration for your ballet party or large paper fan circles made with pretty paper. these steps with the second sheet of giftwrap. or stuck to a wall behind a dessert table. Last week The Dressing Up Chest hosted a party for their photoshoot and I’m sure you will agree their tutu’s are beautiful. They are designed and made in the UK by The Dressing Up Chest team and would make a great costume for your little ballerinas. Towers of pretty pink macaroons will delight your guests. Cupcakes topped with ballerinas and tutu’s would be perfect for this theme aswell as a dessert table with pink popcorn, tutu or ballet shoe cookies and delicious pink jellies. Party games can be ballet themed takes on traditional games, maybe pin the ballet shoe on the ballerina, musical pirouettes but be careful nobody gets too dizzy! Perhaps your little ballerinas would enjoy creating a ballet show for when their parents arrive to collect them. Another idea would be to contact your local dance school to see if they offer ballet parties, teaching basic steps to budding ballerinas. Most importantly, have lots of fun!